Twitter is "experimenting" with a new update to its mobile iOS and Android apps that is said to make it easier for users to share videos and photos on the social network. According to people familiar with the matter, speaking with Bloomberg, the update is still in an early testing phase and could "change significantly" over the next few months, but comes at a time when Twitter is looking to attract more users and convince current users to stick around. 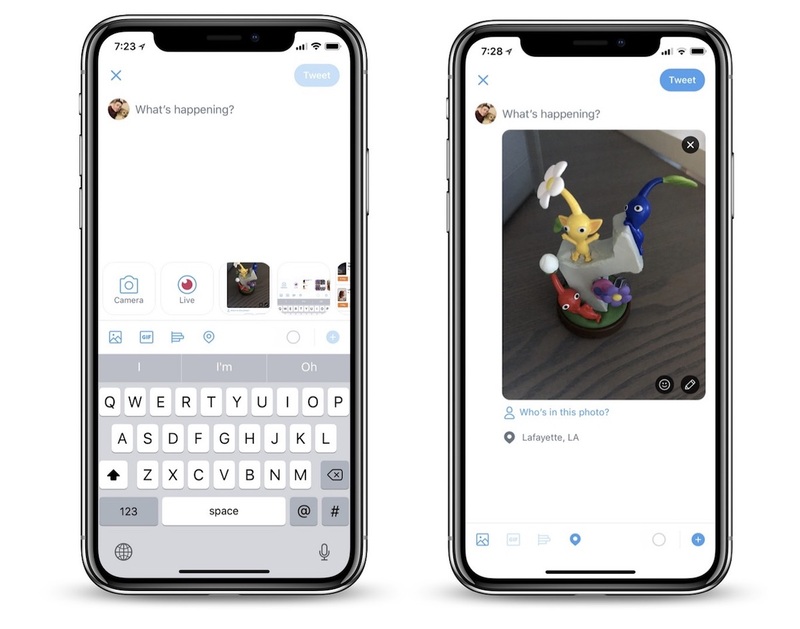 The exact design of the update wasn't specified, but Twitter is said to have a working demo of a "camera-centered" update that will "entice people" to quickly and easily post video clips of what's happening near them. Bloomberg compared the description of the camera feature to Snapchat's mobile apps, which open to the camera first so users can quickly take snaps. In 2016, Twitter CEO Jack Dorsey admitted that the network can be confusing to newcomers and called Snapchat "very modern." To be clear, it doesn't appear that Twitter aims to launch "Twitter Stories," but is simply looking to rearrange its app in a way that allows for more prominent placement of the camera. Social-media leader Facebook Inc. has famously copied innovations from Snap Inc.’s Snapchat, a mobile app focused on ephemeral photos and videos that’s popular with younger audiences. Twitter’s latest change suggests that Chief Executive Officer Jack Dorsey is taking cues from the newer company as well. Currently, to post a video or photo on the Twitter iOS app, users have to open the app, tap to compose a tweet, tap "camera," capture a video or photo, add it to the tweet, then tap "Tweet." Those near Twitter's testing of the new feature claimed that "the goal of this product is to reduce the number of steps," aligning it with Snapchat's camera-first user interface. Video has become a priority for many social media companies over the past few years, including Facebook's frequent updates that introduced an Apple TV video-only app, a dedicated video tab for the iOS app, and a simple right-swipe UI to jump into the camera on iOS and post a Snapchat-style Story. Instagram has a similar right-swipe interaction to launch the camera, and was the first of Facebook's apps to begin the copying of Snapchat Stories back in 2016. Currently, to post a video or photo on the Twitter iOS app, users have to open the app, tap to compose a tweet, tap "camera," capture a video or photo, add it to the tweet, then tap "Tweet." [...] In 2016, Twitter CEO Jack Dorsey admitted ('https://www.macrumors.com/2016/06/02/jack-dorsey-twitters-stagnation/') that the network can be confusing to newcomers and called Snapchat "very modern." Which one of steps are people suggesting shouldn't be necessary to tweet? You should be able to skip opening the app? You should skip hitting a button to start composing and taking a picture? You should skip the confirmation step? Those steps all seem perfectly logical and to skip them would just sound like a confusing invasion of privacy. I wouldn't say Twitter is the most obvious of social networks, but to try saying Snapchat is anything but the most confusing pile of garbage to ever have been labeled a social network is just bizarre. Snapchat is popular, I'll give you that, but I think it's despite the horrible UI/X, not because of it. People like how easy it is to augment the picture they're taking in Snapchat - that's the core thing that you should look to copy, if you want to copy something from Snapchat.